Our experiences from canyoning in El Salvador. After arriving in the town of Tacuba in El Salvador, we checked into the hostel “Mama y Popa’s” and asked the standard question you usually have when you find yourself in a new town you know little about. “So, what’s there to do here?” We were shown to a faded poster advertising tours in the Parque Nacional Imposible just outside of town. After quickly reading about the amazing hikes and views on offer in the national park, Lesh grabbed my attention and pointed to a small blurb at the bottom of one of the pages. It described a day-long adventure of following a creek down through a valley with 7 obstructions to overcome along the way. A series of waterfalls and rocky outcrops that you either have to jump off or abseil down to move onto the next section. 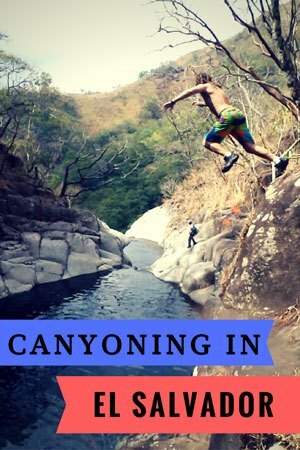 Canyoning in El Salvador? This sounded like a perfect day out! Without pausing for a moment of consideration, I hastily made my way back to the reception to book ourselves on this fun-packed tour. The next morning we met with two other travellers in the hostel common area and eagerly awaited our departure. The son of the owner of the establishment was to be our driver. After a briefing which contained little more information than, “Are you guys ready to go jump off some waterfalls?”, we hit the road. The drive was a gorgeous 45 minute jaunt over rough terrain into the heart of the national park. We stopped along the way for the obligatory photo opportunities, and then reached the trail-head. We were introduced to two local men who were to be our guides to the bottom of the valley, and they gave us a bit more of a run down on what to expect. Without any more delays, we started the hike. Canyoning In El Salvador? Yes Please! It was an absolutely stunning setting, with overgrown trees, vines, moss and rocks all fighting each other to be the dominant features on the track. Shortly we came to the start of the creek, and started following it towards lower elevation. It wasn’t long before we came to our first hurdle. A small, cascading fall of about 2m that was an easy introduction to prepare us for what was coming up. We all leaped off gleefully, and continued on. At this point, Anna, who was was one of the backpackers with us on this tour, began to feel quite sick. But with some encouragement from her friend, she continued on. The first obstacle we came across. In a matter of minutes we were confronted with our next leap-of-faith. A slightly higher 5 metre ledge into a small circular pool. Only this time, we had a whole collection of boulders to launch out over to avoid almost certain bone fractures. Without hesitation I threw myself as far out from the jumping point as possible, and just cleared the pain-inducing stones. Alesha was far more sensible and opted to abseil down the slippery surface. The next 4 checkpoints all offered similar scenarios, ranging in height from 3 to 8 metres, and one more including a heart-stopping long jump to clear the treacherous cliffs below. The landing zones weren’t exactly forgiving either, with our guides throwing pebbles onto the spots we had to land on with pinpoint accuracy to avoid the hidden rocks lying just below the surface. Lesh getting psyched up to jump. It’s not all death-defying leaps! Now that adrenalin was well and truly pumping, we reached the edge of a 30 metre high waterfall and admired the openness of the gorge in front of us. Our guides gave us an option of hiking down to jump off the final, and highest, point or to stay at the current height and avoid the steep, tiring trail to get back up. Anna, whose health was progressively worsening, opted to stay at the top, and the rest of us excitedly set off for the diving board. Looking down from the top of the waterfall. The last cliff jump was a solid 10 metres, with only a small ledge to jump out and avoid on the way to the large, deep pool at the base of the waterfall. I was the first one to throw myself off this point, and crawled back up for a second turn. We asked Lesh if she would like to have a go, fully expecting her to turn down the offer and keep her feet safely planted on Terra Firma. Instead she shocked us all by shrugging her shoulders and saying, “ah, why not?” She had never jumped from something this high before and it was a huge deal for her. But after very little pause-for-thought, and only a little encouragement, she took a breath, bent her knees and leapt as far out as she could and let gravity draw her back to the Earth at tremendous speed. She landed perfectly and we were all thrilled with her effort! Lesh throwing herself off the cliff. After a few more jumps and a couple of photos we began the long trek back towards the start of the trail-head. When we met up with Anna at the top of the waterfall, her energy had drained and she looked terrible. We continued to walk up the trail, and every 20 steps or so, she had to stop to rest. Unfortunately there was no other way out from the bottom of the valley except for climbing the deceivingly steep track for a rapid altitude gain. When she collapsed and announced she couldn’t go on anymore, we had to improvise a solution. With the guide’s machete (a tool you never enter the jungle without), they began hacking up tree branches to construct a makeshift stretcher. With their climbing rope, we lashed it all together and had Anna lay down on it. It was definitely not comfortable, and hardly built to any sort of safety standards, but it was all we had. We each grabbed a corner and began carrying Anna up the steep switchbacks towards the top of the mountain. It was tiresome, awkward and slow, but we were making progress. We met a local man on the trail who ran to our waiting vehicle to inform the driver of the situation. They ran down to meet us with a hammock and we disassembled our stretcher and chopped down a longer, larger branch. We tied the hammock to the branch, took an end each and provided Anna with an authentic El Salvadorian bush ambulance! We had made it past the steepest part of the hike luckily, and now had a much more manageable pitch to contend with. Hauling Anna up the mountain. Our patient slowly making her way back to civilisation. We each took turns carrying our patient and with the daylight hours quickly dwindling away, we finally made it to the pick-up truck for our ride back to Tacuba. We sat down on the dirt, exhausted from our mission to the top, but relieved that we had managed to help get everyone back to safety, eventually. At the end of the evening, we all sat around drinking some cervezas and laughing about our adventure-filled day. Anna had begun to feel better once arriving back at the hostel and managed to have a good chuckle about how fun the day had been. We were glad everything had worked out well in the end, and secretly I was quite excited that I got to test out some bushman survivor skills with the locals. Lesh and I almost completely forgot that most of our day had been taken up by hiking through beautiful forests, swimming in refreshing water and leaping from remarkable waterfalls. Usually, however, the most exciting activities are the unexpected ones.